Having lived his entire life in Southern California, near the Pacific Ocean, the motion and rhythm of the ocean's waves are a major inspiration for John's work. Contrast is also an important element for him; not only aesthetically but in the process of turning a functional object, like a bowl, into an 'object d' art'. John likes to combine multiple woods with dyes and textures to enhance the rhythmic lines that are a part of his work. He also enjoys including a certain 'how did he do that?' factor into his pieces while ensuring that he stays true to good design. 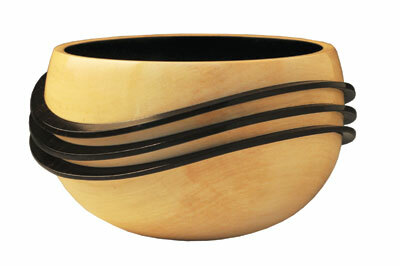 This holly (Ilex spp) and ebony (Diospyros spp) bowl is part of John's 'Wave' series. The idea for the 'wave' came from his time spent in the ocean; but figuring out how to do it was much more difficult. After a few unsuccessful tries, he came up with a solution that while in concept is fairly simple, to do properly required that he build a three-axis jig that held the bowl in the chuck which mounted on a bandsaw. The inspiration for the black interior of this bowl comes from the Terra Sigillata Slip used to seal Greek pottery. By dyeing the interior of the vessel and extending the 'waves'beyond the exterior, he has tried to give the feeling that the 'waves' are coming from the inside through the exterior wall of the vessel. Constructing this piece requires turning and finishing the holly body, cutting the wave patterns, adding the ebony layers, and reconstructing the bowl one layer at a time. According to John, one of the biggest obstacles is keeping the holly aligned when reassembling the bowl. It is John's hope that his pieces will evoke a feeling of movement and energy in an otherwise static environment.